Tour Company Used By Otto Warmbier Will Stop Taking Americans To North Korea : The Two-Way Young Pioneer Tours has also updated its North Korea FAQ page, starting with its top question: "How safe is it?" 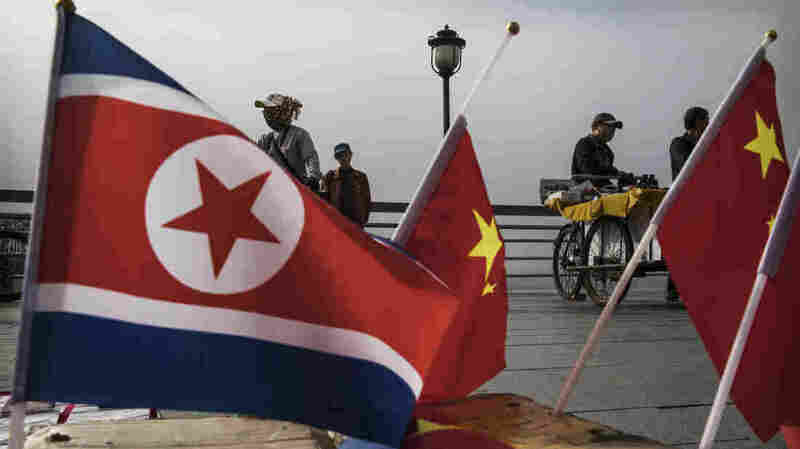 A China-based tour company says it will no longer take U.S. citizens to North Korea. Here, Chinese vendors sell flags of North Korea and China along the Yalu River in Dandong, northern China, along the border with North Korea. Young Pioneer Tours, the travel company that took Otto Warmbier on a fateful trip to North Korea, will no longer take U.S. citizens into North Korea. The company says the "tragic outcome" of Warmbier's trip — the American died after being jailed and had been in a coma — prompted the change. Based in China, the touring company promises "adventure holidays"; trips like the one Warmbier took commonly include round-trip travel from Beijing, with several guides for groups of up to 24 tourists. "There had not been any previous detainment in North Korea that has ended with such tragic finality and we have been struggling to process the result," Young Pioneer Tours said in a statement on its website. "Now, the assessment of risk for Americans visiting North Korea has become too high." Warmbier, 22, was a student at the University of Virginia when he was arrested in Pyongyang in early January 2016, accused of trying to steal a propaganda poster from an employee area of his hotel. Within weeks, he was sentenced to 15 years in prison and hard labor. His release some 17 months later came as a surprise, particularly when it was revealed that he was in a coma. North Korean authorities said Warmbier fell into a coma after contracting botulism and taking a sleeping pill. But after his return home to Ohio last week, doctors said they suspected his condition had been caused by cardiopulmonary arrest. Last week, Warmbier's father, Fred Warmbier, said his son had been "lured" into traveling to North Korea by Young Pioneer Tours and that the company had promised its customers were never detained. Instead, Warmbier said, the company helped his son become "fodder" for the isolated regime. In the wake of Warmbier's detention and death, the Young Pioneer Tour company has updated is "North Korea FAQ" page, starting with its top question: "How safe is it?" Weeks before Warmbier took his trip, the travel company's response to that question began (according to a Web archive), "Extremely safe! Despite what you may hear, North Korea is probably one of the safest places on Earth to visit." It now begins: "Despite what you may hear, for most nationalities, North Korea is probably one of the safest places on Earth to visit provided you follow the laws as provided by our documentation and pre-tour briefings." And where a one-paragraph answer had previously sufficed, the reply is now three paragraphs. The move to stop taking Americans to North Korea comes after the country had relaxed some of its travel restrictions in recent years — including granting tourist visas to Americans in 2010, Young Pioneer Tours says. But in May, the U.S. State Department reiterated its warnings against traveling there, saying at least 16 Americans had been detained in North Korea in the past 10 years. As NPR's Michele Kelemen reported last week, U.S. Secretary of State Rex Tillerson said his agency is considering a travel visa restriction to North Korea; but that would stop short of a full travel ban, which would require action by Congress.